Do you want a great sewing machine at an attractive price? No problem at all. With your bernette! Do you want a great sewing machine at an attractive price? No problem at all. With your bernette! 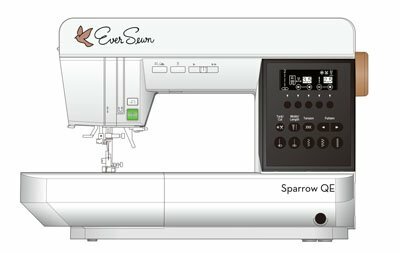 The EverSewn Sparrow X is a next generation sewing and embroidery machine. 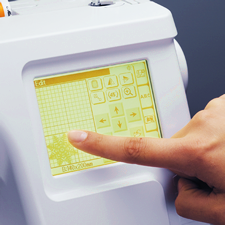 The embroidery functions are controlled with a smart device. WIFI is not required. Technology is integrated and works with Apple® or Android™. The App offers an easy way to get from inspiration to the stitched-out design. 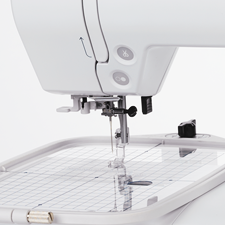 This state-of-the-art sewing and embroidery machine is perfect for every sewist that loves to create. 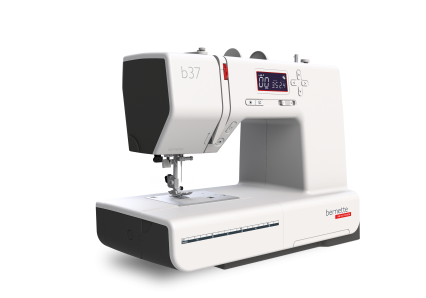 Sewing Machine features: -Thread cutter, one-step button hole, speed control, needle up and down, electronic tension adjustment, straight-stitch plate included. -Presser foot pressure adjustment. -Over 120 different stitch patterns. -Advanced auto threader. Embroidery Features: -Two hoops come with the machine (large and small) -Over 100 embroidery designs included -Reads most common embroidery files (EXP, PES, DST...) No ART -Max embroidery speed 650 rpm -Max embroidery area of 4.75x7 inches -Automatic thread trim function between jump stitches -Thread away function for clean embroidery surface -Multiple thread sensors -Machine controlled with smart device (Android or Apple) -App offers design modifications, easy placement and monitoring features. Friendly Interface Forget about the small and unclear screen on your old sewing machine. 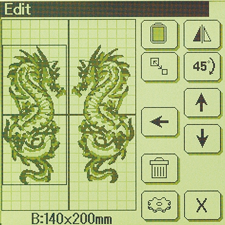 Now you can use your mobile device (cell phone or tablet) to create your designs with more freedom. Our App allows you to customize your design in a few easy steps. Wi-Fi Support With a built-in Wi-Fi connection, you can monitor the current embroidering progress without being in front of your machine. The App notifies the user about all important values (time for embroidery left, next thread colors and the current status). Editing Tools Download the App "EverSewn Pro". It provides a series of tools that allow users to import other embroidery files, change thread colors, and adapt the patterns without limitation. 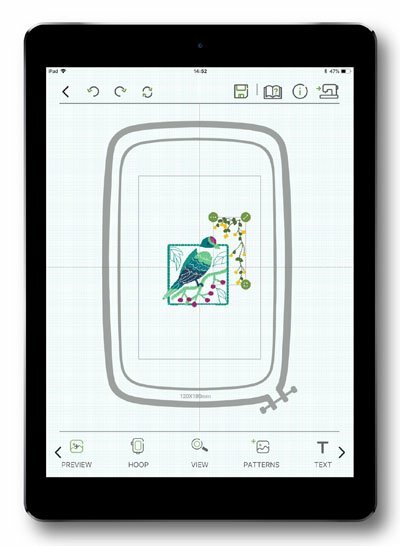 This easy-to-use tool substitutes basic embroidery software and offers a one-touch experience like you have never experienced before! Perfect stitch quality, ease of use and a modern design makes the Sparrow X one of the most anticipated products of 2018! 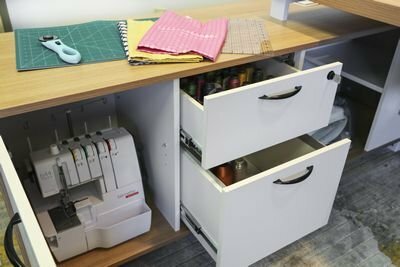 This machine will get every crafter, beginning sewist or quilter excited for embroidery and they will find embroidery easy, fun and exciting. 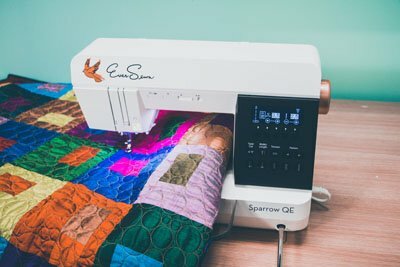 The EverSewn Sparrow QE is a great sewing and quilting machine. 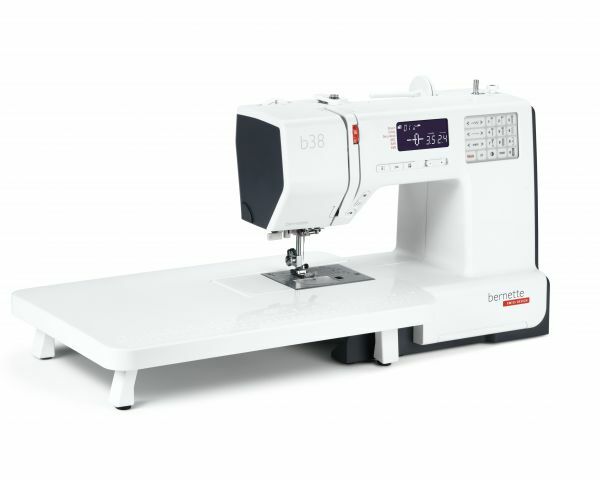 The impeccable stitch quality, modern design and unique sewing features makes it the perfect quilting and sewing machine! It offers everything a creative sewist could need at a very attractive price / performance ratio. Key Features: The Sparrow QE has an 8 inch sewing throat that can easily handle larger quilts! 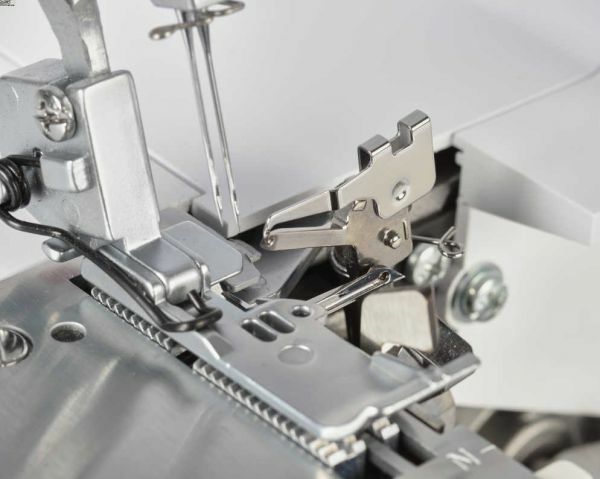 The machine comes equipped with a knee-lifter, thread cutter and additional straight stitch plate. 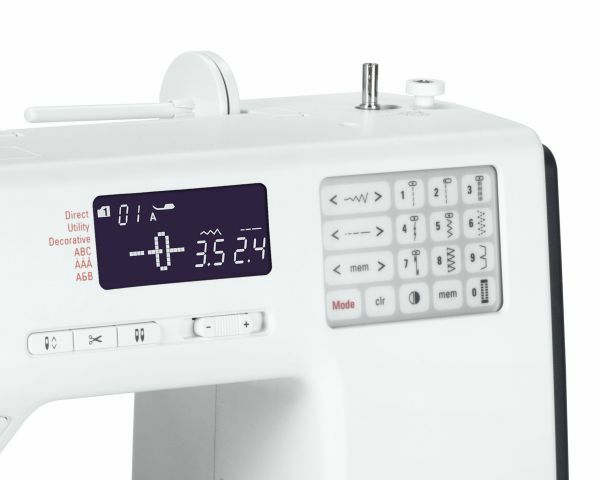 With over 70 stitch patterns, a very intuitive control panel and a flawless stitch quality - this is the perfect machine for every quilter! 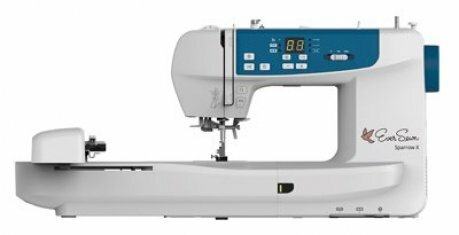 With over 850 RPM sewing speed, approximately 16lb., a 7mm stitch width and all other EverSewn key features this really is a great mid-range machine. 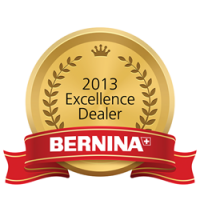 The affordable top model in the bernette series of sewing machines, with a wide range of functions and accessories. When you change from a single to a double needle, the "double needle button" will help you adapt your needle to the presser foot so that neither needle will inadvertently hit the presser foot and break off. 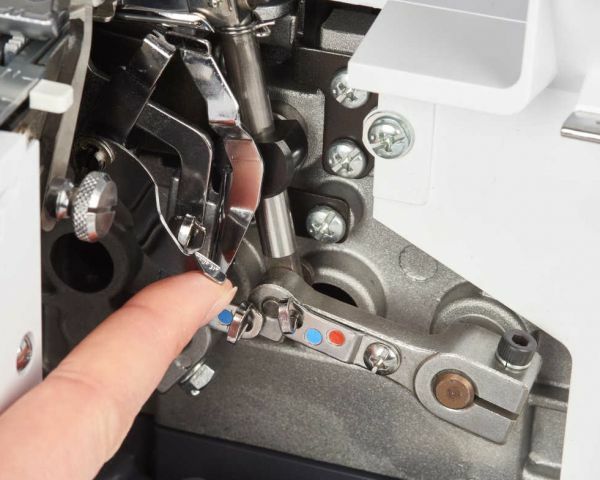 The "double needle safety" function limits the stitch width so that the needle doesn't hit the presser foot. For some materials, such as lightweight or thin fabrics, it is advisable to adjust the presser foot pressure. Your bernette 38 offers this practical feature. When you get to the end of a seam, the thread has to be tied off to prevent the seam unravelling. Normally, you would do this by making a quick backwards and forwards stitch. This is no longer necessary with the bernette 38, as it has an automatic tie-off function. Simply select the Tie-off button and the end of the seam will be tied off automatically. 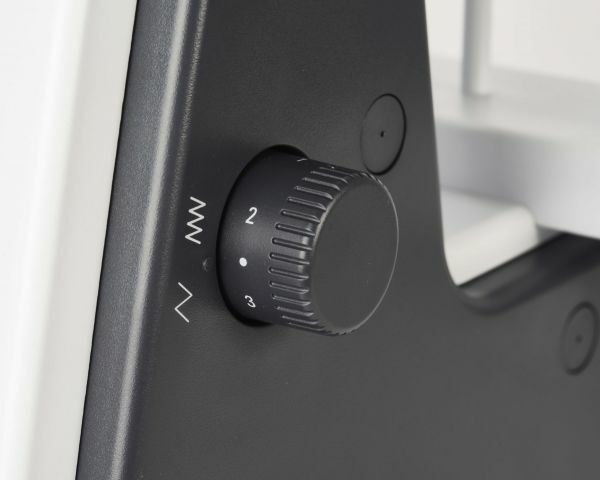 When you have finished your sewing project, press the button for the automatic thread cutter and you can pull your completed work out from under the needle without having to reach for the scissors. 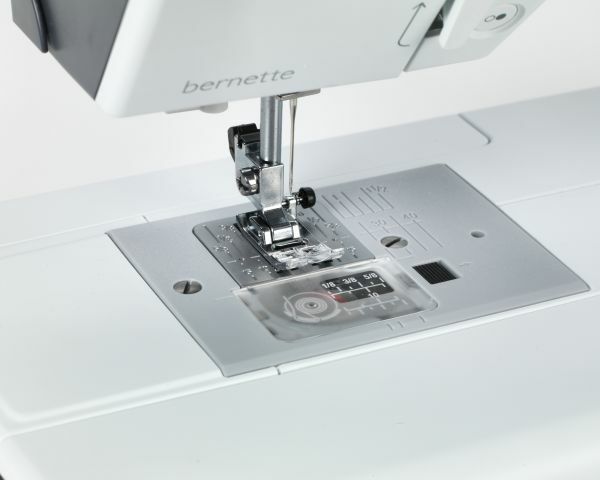 The extension table supplied with the bernette 38 is easy to attach and detach, and gives you more space for large sewing projects such as clothes, quilts or curtains. 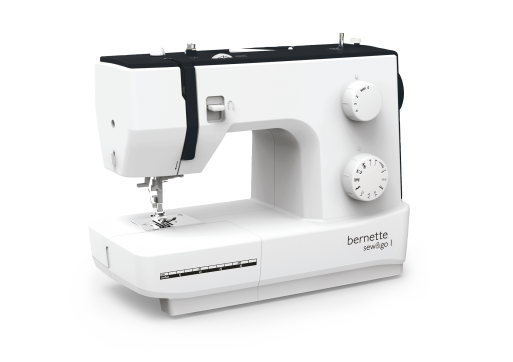 The Bernette B44 Overlocker is a great value featuring an abundance of features and accessories at a relatively low cost. 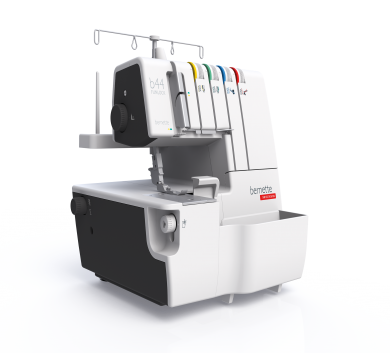 The bernette Funlock 44 is easy to operate, even for beginners, because the 15 different stitches with 2, 3, or 4 threads ensure maximum flexibility when selecting stitches. And, at the same time, you always achieve a professional stitch quality. In addition to the 2, 3 and 4-thread seams, you can also provide your sewing projects with excellent rolled hems with a width of up to 1.5 mm. The colour-coded, open thread path makes the bernette Funlock 44 easy to thread by following the coloured markings. A separate needle threader and lower looper threading mechanism also make threading easier. The most important overlocker accessories are always to hand in the looper cover. Other accessories are stored in a separate box. 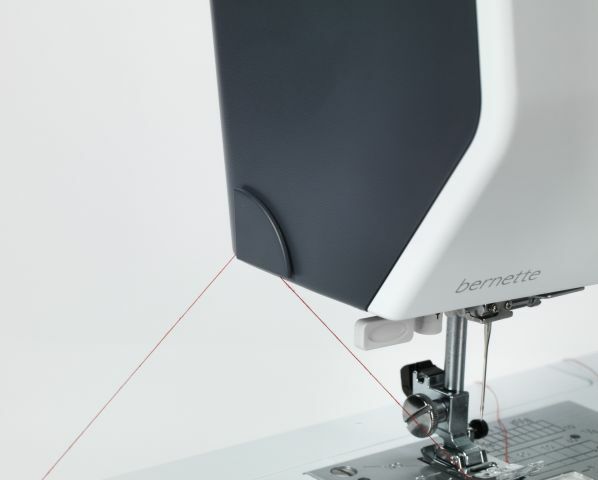 With the bernette Funlock 44, your sewing is always uniform, even at 1300 stitches per minute. The overlocker even sews and cuts thicker fabric with ease and precision, in a single step. The seam allowances cut off during sewing drop into the waste collector that comes with the bernette Funlock 44. What is the differential feed for? The differential feed always ensures smooth seams with knitted fabrics and crimp-free seams with fine fabrics. By adjusting the setting between 0.6 and 2, however, deliberate crimping can also be created, e.g. for decorative ruffles. An affordable sewing machine with a wide range of features and impressive stitch quality. 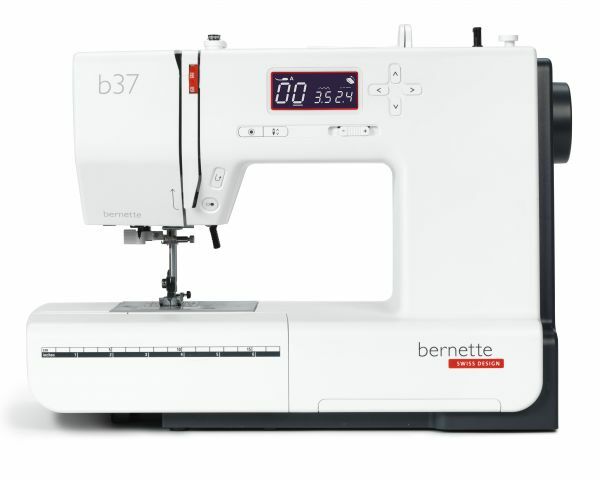 The bernette 37 has over 50 different stitches, consisting of 17 utility and stretch stitches, 2 darning stitches and 19 decorative stitches, 5 buttonholes and 7 quilting stitches. This means you are well equipped to handle any sewing project. The stretch stitches enable you to sew elastic jersey fabrics. Not only does the bernette 37 have a wide range of utility stitches, such as straight stitch and zigzag stitch, but it also offers a whole series of decorative and quilting stitches, which you can use to add beautiful patterns to your sewing projects. 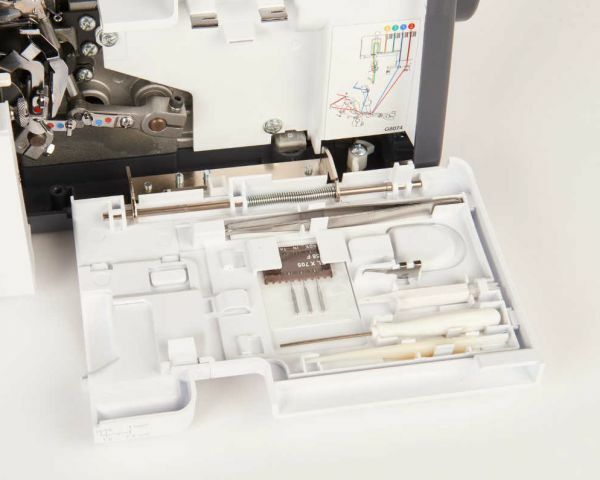 The bernette sew&go 1 is a mechanical sewing machine and the entry model for the sew&go family. With 10 stitches and a maximum stitch width of 5 mm, it provides excellent basic functions at a very economical price. Clearly designed and easy to operate, it‘s perfect for beginner sewers. A full four presser feet (soles), including the buttonhole foot and a zipper foot, come as standard with this model. 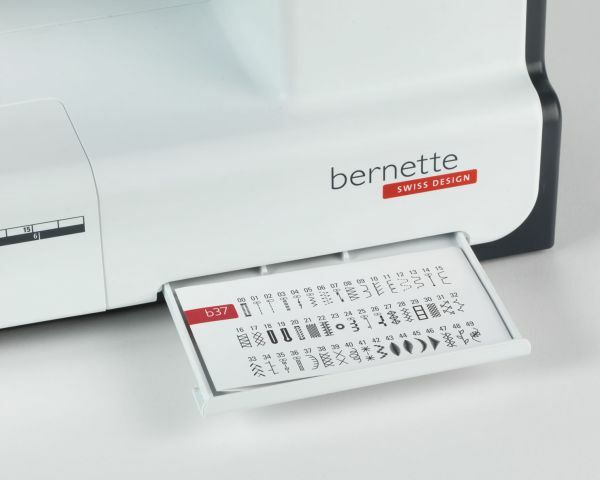 With the bernette 340 Deco you can get started embroidering right after you’ve unpacked your machine, even if you don’t yet have a collection of designs on USB sticks or embroidery cards. Built into the memory of the bernette 340 Deco are 100 embroidery designs which you can also easily rotate, mirror, combine, and rescale on the touchscreen. From the first stitch on, you have access to a library allowing you to create a host of great embroidery projects – an outstanding foundation for your own personal design collection. And of course you can also alter the colors of the designs, customizing them according to your personal taste and your project. In this way, the bernette 340 Deco helps your creativity soar with its wide variety of functions and features. 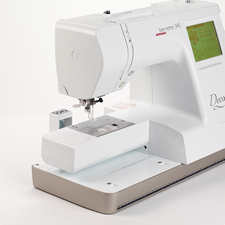 The bernette 340 Deco features a convenient Drag & Drop function to help you position your embroidery design exactly where you want it. Simply touch the design on the screen and drag it to the desired spot – done! 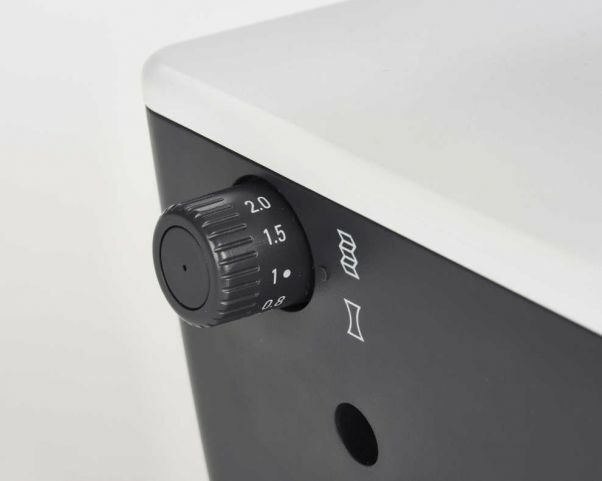 It’s simplicity itself to move your selected design to fit inside the embroidery area and stitch it out in first-class quality with your bernette 340 Deco, without having to fuss with settings beforehand. Thanks to this ease of handling, embroidering with the bernette 340 Deco is a real creative pleasure – the ideal combination of precision and intuitive operation. Free arm for sleeves, pants & cuffs. Stylishly embroidered sleeve or pant leg finishes are a genuine eyecatcher. With the bernette 340 Deco, it’s a cinch to attractively embellish sleeves, pant legs and other tubular textiles. 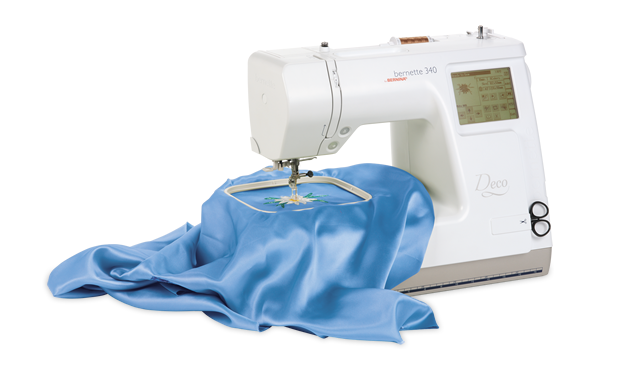 The 340 Deco has a free arm over which your project can be pulled for precise guiding, making it child’s play for you to embroider the designs of your choosing in a single operation. This means that the bernette 340 Deco is an excellent creative tool for a host of embroidery projects – one that will help your creative ideas soar. The bernette 340 Deco boasts a large embroidery area that enables you to embroider designs measuring up to 200 × 140mm (7.9” x 5.5”): plenty of scope – and room – for creative designs and motif combinations. You’ll be able to embroider large designs in a single run, without having to stop.This not only saves you time, but ensures maximum precision. Thanks to the unbeatable versatility of the bernette 340 Deco, it’s easy to embroider even complex, elaborate designs. Lux Living Working Station with Tuck Cabinet and optional High Rise Drawer Systems. 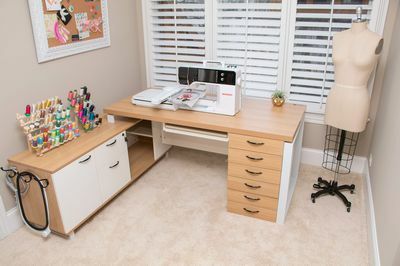 Modern and modular, you'll experience sleek, solid, and expansive sewing at its finest with our EverSewn Loft Series Working Station System. Choose the configuration that works best for your individual space and storage needs. The solid construction of the wood table and metal framing system ensures a quality experience. 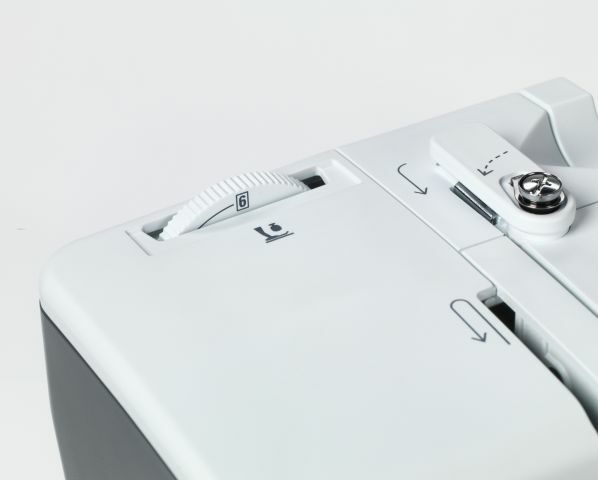 The Loft Working Station comes standard with a removeable machine cut-out to insert machines up to the size of a BERNINA 7 Series model. Machine table inserts are also available for purchase. Simply specify your chosen machine when you order to easily customize your loft to suit your exact machine needs. Machine table cut-out measures 21" L X 11.75" W. Machines up to 20" L x 8" W will comfortably fit the cut-out. Table Measures 63" Long. Copyright © 2007-2019 - Sew This!